Our challenge is to find a way to unite and harness our diversity in order to improve how we serve the communities we work with every day. At Capital Impact Partners, we think so. The fact is, while we are all here to fulfill our mission, each person brings his or her different life experiences to his or her job. Some of our staff members interact with our communities daily or weekly, while others spend their time focused on activities at the office. Our challenge is to find a way to unite and harness that diversity in order to improve how we serve the communities we work with every day. This is why we organized our Inclusion, Diversity, Equity and Awareness (IDEA) Committee—a reincarnation of a previous endeavor we called Cultural Awareness to Create Harmony (CATCH). The new name and evolved focus aligned the team’s efforts with the five-year strategy—our 2020 Vision for Communities—that Capital Impact launched in 2016. Through that strategy we are focused on addressing poverty, creating equity, building healthy communities and promoting inclusive growth. While the IDEA team is made up of a variety of staff members, I’m proud to say that this effort is supported throughout the organization, including being sponsored by our President and CEO, Ellis Carr. Since IDEA launched under its new name in 2016, its members have taken that sentiment to heart. IDEA committee members Emilie Linick and Khaliff Davis share a moment at our Detroit retreat. 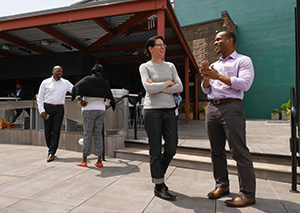 At our corporate-wide offsite in Detroit, Michigan, the IDEA members lead the organization in a facilitated group activity called the Privilege Circle. IDEA members had drafted a series of statements related to “earned privilege” and “unearned privilege” (i.e., “I grew up with money,” “I went to a good school,” “I grew up with books in my home”). With staff facing outward and eyes closed, the statements were read aloud and members who identified with each clapped. In this trusted environment, generally accepted concepts of privilege were identified while others considered surprising also surfaced. 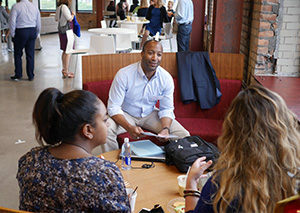 Capital Impact staff member Uriah Summers participates in a discussion with colleagues at our Detroit retreat. Recognizing both “earned” and “unearned” privilege is an important activity, as it allows staff members to reflect on their privilege and leverage that understanding in how they interact with others to enhance their own work. After a series of violence in the summer of 2016, the IDEA team facilitated a discussion about the events among nearly half of the Capital Impact staff gathered in our offices and virtually. The discussion reflected on social injustice and intolerance in the country as evidenced by shootings of people of color. But it also allowed the staff members to reflect on the incidents on a personal level. They also engaged with each other directly about how social injustice and intolerance affect their own identity or the lens through which they engage with their community and the communities Capital Impact serves. “The Brown Bag discussion effectively pulled positivity out of a very dark series of events,” recalled on IDEA team member. 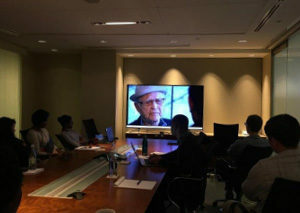 Most recently, staff members at Capital Impact Partners honored the National Day of Racial Healing by holding a screening of the documentary series America Divided: In a Divided Country, Our Stories Unite Us on inequality in housing, health care, criminal justice and the political system. The screening was spearheaded by the W.K. 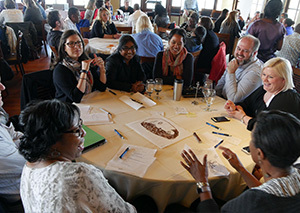 Kellogg Foundation, a funder and investor of ours, as “a response to the broad call for racial healing following the contentious rhetoric, hate crimes and vivid expressions of racism.” Following the screening, an IDEA member facilitated a guided discussion about the film and gave attendees the opportunity to reflect on the holiday. Addressing these issues and making sure everyone comes away from the discussion or activity feeling engaged rather than shut down is not an easy task. There is an inherent discomfort in talking about privilege. And there is also the question: How do we leverage our individual privilege in a productive way? In order to be successful in implementing any strategy, an organization needs to be knowledgeable and do its research—both quantitative AND qualitative, externally and internally. In order to best serve our communities, we need to understand them institutionally and personally. Capital Impact Partners understands the societal structures in place that affect underserved communities. IDEA helps us raise awareness of these communities on a personal level. The sharing facilitated by IDEA members brings a level of closeness and fosters trust. It puts a human face on the staff and those for whom we are working. We recognize that we come from diverse backgrounds and diverse areas of privilege. Sharing these insights strengthens the organization as a whole. And, it allows staff members to leverage strengths, address weaknesses, learn where understanding is lacking and foster an ongoing sense of safe and progressive communication. 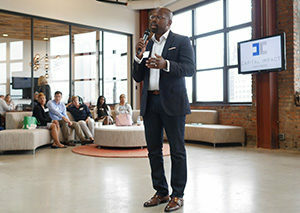 In order to meet the demands and goals of our work at Capital Impact Partners, it is clear that we need to understand the root of how our own values were formed, and, subsequently, our class and privilege. Also, we need to recognize the identities and circumstances of our own colleagues to help us better serve our customers. IDEA is one great idea to move us in that direction.